They try and make moving sound easy. They try to make it sound like the move takes place in the span of one day. Like the actual moving of your items is the hardest thing you’re going to do. This is not true. Packing. Packing will drive you nuts. I packed, in my spare time, for just over three weeks. Can you even believe that. Packing is tricky. It will fool you up front. I stocked up on boxes, then I started to sort things into them. Things seemed to be going smoothly. Items were fitting nicely in the boxes and I felt like I was getting things done pretty quickly. But before I knew it – all that changed. Soon, I ran out of the right boxes. I had to be strategic and figure out interesting ways to get my pots in a box that’s not too small (so it actually fits the whole pot) but not too big either (because someone has pick up that box, so it can’t be heavy). If I could even find a box like that left. Then before I knew it, the boxes I thought would be more than enough, were all used up and I still had half a home left to pack. I became a scavenger for boxes. I asked friends and family. I started going to grocery stores that offer boxes to put your food in. I eyed up the printer paper boxes from work. I would take whatever box I could get. I’m getting a little stressed just thinking about it, so let’s skip the part about how much tape, bubble wrap and news paper you’ll need. Then, there came a time, on moving day, when I thought I had got the best of packing and not the other way around. The movers had the van full. The house was empty. I just needed to do a quick walk-thru and make sure the house was in good shape. Upstairs was clear, the basement was clear, outside was clear, the main floor was….O-M-G!…there was two full drawers of pots and pans that had been left in the house. I turned around. Everything else was gone. There were no boxes left for these pots and pans. My only option was to carry them out to my car and put in them in the back of my Mini. As I drove away from my old house, I could hear the pots and pans bumping and scraping in the back of car. Packing had beat me. 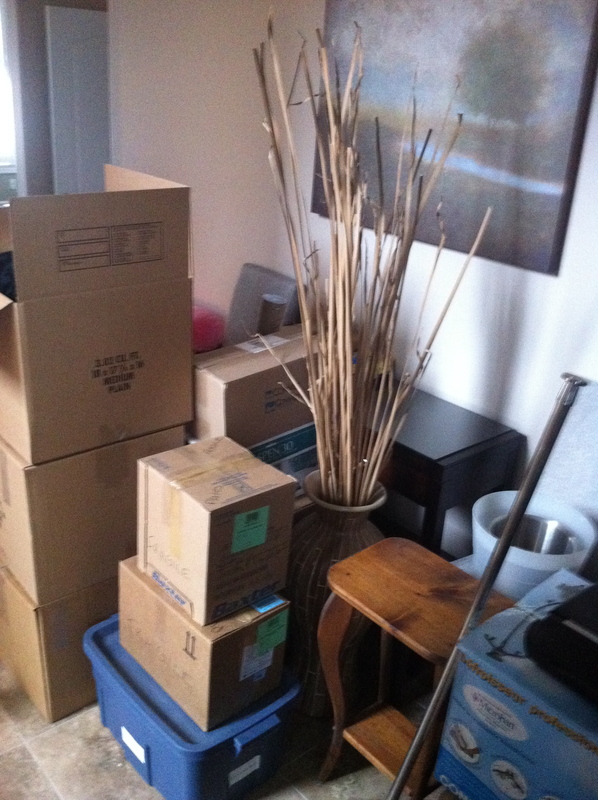 I’m now in my new house, which happens to be very old and I have a lot of boxes to unpack. I have a feeling I’m going to like unpacking, as much as I liked packing. That is to say, not very much at all. I long to be a creature of habit. I yearn to have a consistent schedule. A daily routine that includes sleep, exercise, healthy food, work, relaxation and fun. Yet, I can never seem to maintain a successful formula for a long period of time. Yes…I know change is good and I’m not looking to do the exact same thing over and over again for the rest of my life. I’m just looking for a general routine to live by. I believe that if I can get the right mix of activities in a day, at the right time, that everything will be…well…perfect. 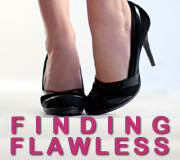 I’ve tried all sorts of variations of my routine in my search for schedule success. I’ve tried going to work early, so I could head to the gym immediately after and then eat dinner as I enjoyed my reality television. I’ve also tried waking up at 6 a.m. every morning and going for a run, so that after work I have time to cook dinner, relax and hang out. I’ve tried only eating take out, I’ve tried skipping exercise all together and I’ve even tried skimping out on sleep – all in an effort to save time. Most recently, I’ve come to accept that I am not a morning person and I’ve decided that I will not wake up before it’s absolutely necessary. I have to be at work at 8:30 a.m. so the the first thing I do in the morning is go to work. I don’t even take the time to eat before work. I grab a bagel and a coffee and eat breakfast at my desk. The only downside to this plan is that I have to do everything else I want to do, after work. So far, I haven’t been so good at fitting everything in. There are those perfect days where I come home from work, head out for a run, cook a healthy dinner, play with my dog and watch a reality show. But…there’s also many days when I come home, skip the run and veg out on the couch, as I eat chocolate and drink wine. So, I admit, I’m still struggling to find the perfect routine to fit everything into my day. I guess I’ll just keep changing until I find the perfect way to stay the same. I am now officially unemployed. My last day of work was Friday and I’m not sure if it has really sunk in quite yet. You see, I had worked for the same company for almost 10 years, when last October, I was told my position was being moved to Toronto. I was asked to move to Toronto with it, but, I choose to stay in the city that I call home. After almost a decade of working for the same company, losing my job has been difficult. As much as I dream of being independently wealthy and never having to work again, the truth is, I’m the kind of person that needs to work. Given that I prefer to be employed, obviously my first priority is to find a new job. Easier said than done! But, I do have great work experience, a fabulous resume and a career counselor for the next three months to help me out. I’ve done a lot right! My only worry is that eventually I will run out of things to do before I actually find a job. I’m off to the passport office today with one of my bff’s, but if you have any ideas for future ways to occupy my time, let me know! I successfully survived the Christmas and Boxing Day chaos and now I’m preparing for the New Year. I already have my plans for the evening, but as usual I don’t have any New Year’s resolutions. It’s not that I don’t believe in setting goals, it’s just that I don’t’ like to limit myself to once a year – I like to set my goals all year long. I know you’ve probably heard before how important it is to set goals, but just in case you don’t believe it – it’s actually been proven that people who set goals and write them down are more successful than those who do not. So, if you haven’t already, go now and grab a pen and paper and start writing some goals down! Do you make New Year’s resolutions? What are your goals for 2011? One of my favourite things to do in my spare time is watch movies. There’s nothing like spending a couple hours wrapped up in good story with a bowl of buttery popcorn. I like to go to the theatre, but I generally I prefer the comfort of my own couch. I watch a lot of movies, so the movie network saves me time and lots of money! I (usually) don’t buy into the marketing hype, so I can wait six months to a year to watch a movie. My movie network subscription includes HBO – who can live without HBO? No question the movie network has taken my movie watching to the next level. OnDemand and PVR means that I can sometimes watch up to five movies on Sunday while I do laundry and clean the house. I’m not at all picky on the types of movies I watch either. I’ll go for a romantic comedy, documentary, drama, musical, thriller – you name it. On the other hand, I am picky about how many times I watch a movie – I really don’t like to watch a movie more than once unless it’s really good. Strange enough, that’s exactly opposite from when I was a kid and I’d watch the same movie over and over again. Can you narrow down what movies you love? What are some of your favourites?